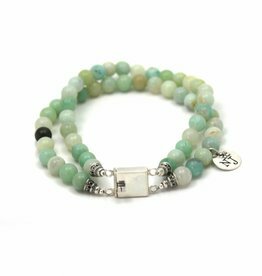 The Amazonite is a green/blue variety of the feldspar and has been used for centuries as a gemstone. Although the stone is said to be named after the Amazon River strangely enough it's never found there. Thousands years before the discovery of South America, amazonite was already known in the Ancient World by the Egyptians for various adornments. Amazonite is found at different locations like Russia, Colorado USA, Canada, Mexico and Madagascar, to name a few countries. 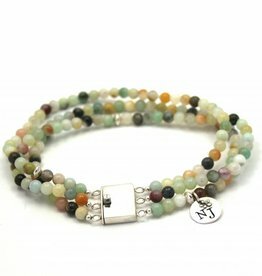 Green amazonite brings balance and is a strong protector against negative energy, electromagnetic radiation (such as cell phones, computers, microwave ovens) and the harmful effects of environmental pollution. Amazonite also brings balance in mood swings, sadness, anxiety or fear. Chakra: fourth (heart) and fifth (throat) chakra.